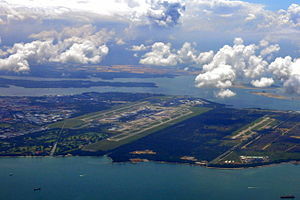 فرودگاه چانگی سنگاپور (به انگلیسی: Singapore Changi Airport) (به زبان بومی: Lapangan Terbang Antarabangsa Changi Singapura) یک فرودگاه همگانی و نظامی مسافربری با کد یاتا SIN است که یک باند فرود آسفالت دارد و طول باند آن ۴۰۰۰ متر است. این فرودگاه در کشور سنگاپور قرار دارد و در ارتفاع ۷ متری از سطح دریا واقع شده‌است. این فرودگاه در رده‌بندی جهانی فرودگاه‌های جهان در رتبه اول قرار گرفته‌است. ↑ Garuda Indonesia operates non-stop flights from both Amsterdam and London Heathrow to Jakarta. ↑ «بهترین فرودگاه‌های جهان در سال ۲۰۱۷». ↑ «۱۷ فرودگاه برتر جهان در سال ۲۰۱۷». ↑ ۳٫۰ ۳٫۱ "Madurai-Singapore flight service to start from September 15". تایمز هند. Retrieved ۲ اوت ۲۰۱۷. ↑ ۴٫۰ ۴٫۱ 2017, UBM (UK) Ltd. "China Eastern adds Quanzhou – Singapore route from Aug 2017". Routesonline. ↑ "China Eastern ends Nanjing – Singapore service in Aug 2017". routesonline. Retrieved ۷ اوت ۲۰۱۷. ↑ "QUANZHOU JINJIANG INTERNATIONAL AIRPORT SCHEDULE". ↑ "Jetstar Asia takes to the skies - and beaches - of Okinawa". Jetstar Asia. ↑ 2017, UBM (UK) Ltd. "Norwegian Air UK launches Singapore service from Sep 2017". Retrieved ۳۰ مه ۲۰۱۷. ↑ "Philippine Airlines schedules Cebu – Singapore flights from Dec 2016". Routesonline. Retrieved 2017-02-12. ↑ ۱۶٫۰ ۱۶٫۱ ۱۶٫۲ ۱۶٫۳ "SilkAir to Transfer Kuching and Palembang Services to Scoot". www.silkair.com. ↑ "United Airlines serves up San Francisco – Singapore service". anna.aero. ۶ ژوئن ۲۰۱۶. Retrieved ۳۰ مه ۲۰۱۷. ↑ "AirBridgeCargo is on its way developing services in Asia | Company news | Media Centre | AirBridgeCargo". airbridgecargo.com. ↑ "Air HongKong". Retrieved ۱۰ مه ۲۰۱۵. ↑ "Cardig Air Scheduled Timetable". Cardigair.com. Retrieved ۱ ژانویه ۲۰۱۴. ↑ "Polar Air Cargo Worldwide launches new freighter service to Singapore" (PDF). Changaiairportgroup.com. Retrieved 2017-03-03. ↑ "Emirates SkyCargo Freighter Operations get ready for DWC move". Emirates SkyCargo. ۲ آوریل ۲۰۱۴. ↑ "Etihad Cargo Flight Schedule" (PDF). ↑ "Etihad Cargo operates Boeing 777F to Singapore" (PDF). ↑ "EVA Air Cargo Schedule" (PDF). ↑ "K – Mile Asia". www.k-mile.com. ↑ "New Route From Surabaya to Singapore". My Indo Airlines. Retrieved 29 Jan 2015. ↑ "Singapore Airlines Cargo to commence Singapore-Hanoi freighter service in Nov-2014". CAPA. ۱۴ نوامبر ۲۰۱۴. Retrieved ۱۴ نوامبر ۲۰۱۴. ↑ Flightradar24. "VQ-BWY - Boeing 747-83Q(F) - Silk Way West Airlines". Flightradar24. Retrieved 2017-02-12. این صفحه آخرین‌بار در ‏۱۵ ژوئیهٔ ۲۰۱۸ ساعت ‏۰۰:۳۹ ویرایش شده‌است.